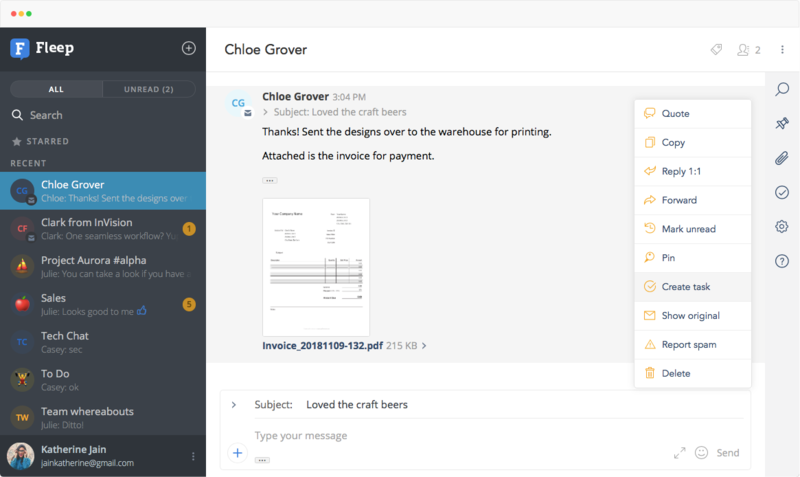 Fleep is the only messenger that interoperates with email. 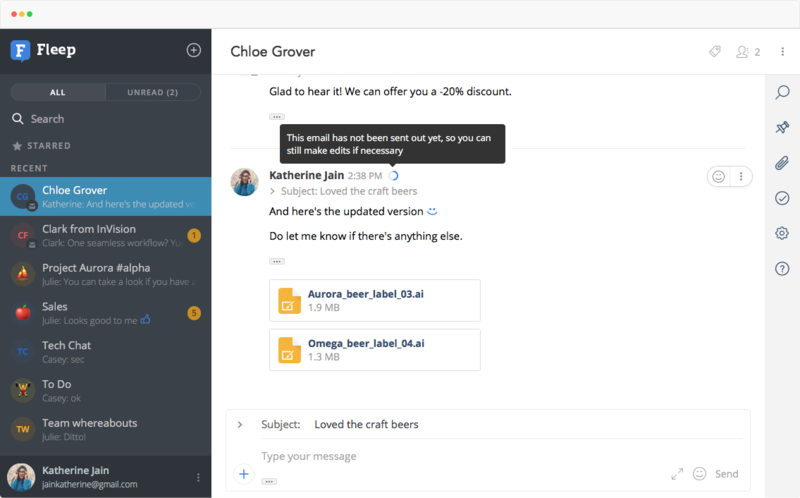 So, you can send emails to Fleep conversations, include people in conversations over email, and even manage your emails in Fleep. Not too long ago, we introduced email headers in the message entry box, so you could see the details of the email you’re composing right where you’re doing it. Now, we’ve also brought this experience to the message flow. This means that you can click on the Subject area on any incoming email to expose the email headers. The details shown there include: the Subject line, “From”, “To” and “Reply-To” email addresses. Simply click on the little arrow next to the Subject line (or anywhere on the Subject line, in fact!) in the message flow to expand and collapse the headers as you see fit! All emails are sent out from Fleep with a 30 second delay. This is useful for when you want to fix any typos or add files you forgot to attach. So whenever you post a message into an email conversation, simply choose “Edit” from the message actions menu within 30 seconds after hitting “Send”, and time stands still until you hit “Save” (or “Cancel”) for your edits. All Fleep conversations have a Taskboard for lightweight task management and a Pinboard for keeping notes, links, and any other important information. What about email conversations? Previously, we allowed for all the same functionality in email conversations, but this led to some confusion as to whether and how Tasks and Pinned messages are sent out to email participants. Now, we have simplified things a bit. You cannot create new pinned or task messages in email conversations, but you can turn any incoming email message into a task or pinned message. In this way, you can create tasks or pins for yourself in the conversations, but nothing will be sent out to email participants. Previously, we showed “Seen-by” indicators for email contacts, to reflect when the email was sent out. Now, we have removed the “Seen-by” indicators for email contacts, because it may have seemed like they showed when the email was actually read by the recipient. Additionally, we have implemented a 25MB file attachment limit per email message. This is pretty standard in the email world, and ensures delivery of the files that you do attach! If your attached files exceed the limit, you will be notified accordingly. We hope you enjoy these updates to email conversations. Send us your all your feedback and kudos at support@fleep.io. You can also follow Fleep for more updates on social media — we’re on Twitter, Facebook, LinkedIn and Instagram.